We start with that quote because today’s note is about the Dow Jones Industrial Average and, of course, about change. The easy bit first: GE is leaving the Dow after being there for 111 years – longer than any other company. The company replacing it, Walgreens Boots Alliance, is all of 4 years old in its current form. At a closing price of $65, it will have roughly 5x more influence on the Dow than GE with its $13 price. Big mistake, that, because since Google and Amazon trade for $1,168 - $1,735 they will never see the inside of the Dow. Remember that the Dow’s largest weighting is Boeing, with a $340 share price and a 9.8% weighting. Google and/or Amazon would swamp the Average. Moreover, with the rise of indexing, companies have less pressure to split their stocks so that’s probably not going to happen with Google or Amazon. Not only is single-stock investing less popular, but also exchange traded/passive funds actually like high priced stocks since US trading commissions are paid per share. Fewer shares for the same trade size equates to lower costs. Of course the other reason the Dow was in the news today was its 13th trip to the unchanged line on the year. 3M (down 15.3% YTD) is responsible for the biggest hit to the Dow in 2018, at 224 points. This is 28% of the Average’s underperformance versus the S&P 500. Worth noting: 3M is one of the most international companies in the Dow, with just 39% of revenues coming from domestic sources. The next 3 losers for the year represent 389 points of headwind, or 49% of the Dow’s slippage to the S&P 500. They are Goldman Sachs (down 10.4% YTD, 174 points), Johnson & Johnson (down 12.3%, 112 points) and Caterpillar (down 9.1% YTD, 103 points). The remaining quarter (23% really) of the Dow’s underperformance to the S&P comes from Proctor & Gamble (down 16.9%, 98 points) and Walmart (down 15.3%, 97 points). #1. Home is where the heart and stock market returns are. We mentioned that 3M generates just 39% of its revenues from the US. The numbers for: JNJ (48% non-US revenues), CAT (54% non US), and PG (55% non-US sales). As for Walmart, although its revenues are still 73% US-based, much of what it sells is obviously made elsewhere. In fact, you can draw a YTD stock price performance line from the zero-return Dow’s heavy non-US exposure to the S&P 500 (39% non-US) at +3.3% to the much more domestic Russell 2000, up 10.3%. #2. 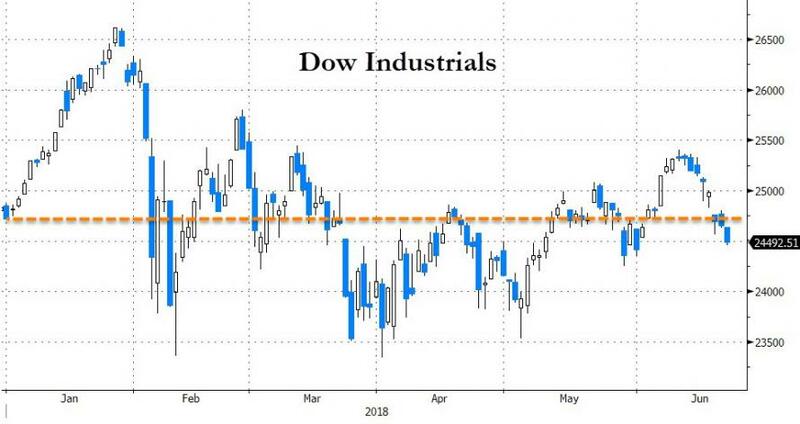 Trade war concerns are one explanation, and certainly a good one for the Dow’s flat-line in 2018 but the S&P 500’s performance needs a few words of explanation. The Tech sector here has both the highest international revenue exposure (58%) in the index and the best performance (+11.7%). Why? By virtue of China’s home grown tech giants (Tencent, Alibaba, Baidu) and the US’s own leaders (AAPL, GOOG, FB, etc), there is little overlap between the two countries and that’s proving to be a powerful positive for US large cap Tech stocks. Yes, Apple has China exposure but Facebook and Google are both banned. And, of course, Apple’s largest manufacturing partner is China, which helps. #3. There seems little doubt that the trade-war-of-words between the US and China will only get worse but we take some comfort in Charles Dow’s quote. Things will change, and eventually for the better. But for now, big cap Tech is (and will remain) a popular parking lot for equity capital.